(From L to R): Doug Anderson, president of Anderson Coach; Tony Mongiovi, VP, sales & service CH Bus Sales; and Ryan Nicklin, director, HR and Safety Compliance, for Anderson Coach. 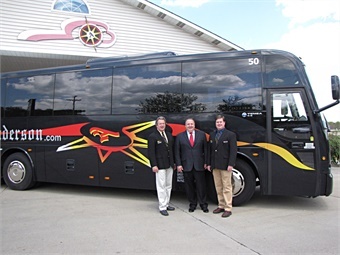 As its preparing to celebrate its 80th corporate anniversary, Greenville, Pa.’s Anderson Coach and Travel recently purchased the 500th Temsa TS35 motorcoach delivered in the U.S. from CH Bus Sales. The 500th TS35 is a 40 passenger luxury coach that sports a metallic black graphics package. Powered by a Cummins 345 HP ISL engine driving through an Allison B500 six-speed transmission, it’s equipped with 110-volt outlets, USB ports, an REI Elite Entertainment system with 15-inch monitors and a woodgrain rubber floor. Like all Temsa’s delivered in the U.S., it has a stainless steel monocoque frame, ample underfloor luggage space and the latest in safety technology. “We have been very pleased with the customer satisfaction, performance and size of the 35-foot Temsa. With the demise of the 47 passenger coach, we began shopping for an alternative to fill the mid-sized vehicle need, because there continues to be demand from customers for a coach appropriate for smaller groups,” said Anderson’s President Doug Anderson. CH Bus Sales LLC is the exclusive distributor of Temsa Motorcoaches in the U.S. and Canada, offering two fully-integral mid-size motorcoaches — the TS 35 and the TS 30 — as well as the full-size TS 45 coach. CH Bus Sales offers strong dependable customer care through full-service facilities in Orlando Fla.; Fort Worth, Texas; and Montville, N.J., in addition to a network of 14 North American authorized service centers. The company also provides dedicated after-sales support including training, parts availability, warranty and technical support. Through its affiliated finance company, Coach Finance Group, CH Bus Sales offers a variety of finance options.